A configuration with loop ramps to safely accommodate left-turning movements that is well suited for the intersection of two freeways. Well suited for use in rural or suburban locations where space is available. The interchanges require more right of way area than that required for a diamond interchange. It requires more travel distance for the left-turning traffic than the corresponding movement in a diamond interchange. Use of the loop ramps generates a weaving movement within a short distance. 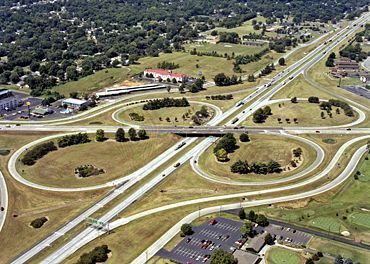 Cloverleafs are four-leg interchanges that employ loop ramps to accommodate left-turning movements. Interchanges with loops in all four quadrants are referred to as “full cloverleafs” and all others are referred to as “partial cloverleafs”. A full cloverleaf may not be warranted at major-minor crossings where, with the provision of only two loops, freedom of movement for traffic on the major roadway can be maintained by confining the direct at-grade left turns to the minor roadway. Green Book Figure 10-68, "Minimum Ramp Spacing"
The principal disadvantages of the cloverleaf are the additional travel distance for the left-turning traffic, the weaving maneuver generated, the very short weaving length available, and the relatively large right of way area needed. When collector-distributor roads are not used, further disadvantages include weaving on the mainline roadway, the double exit on the mainline roadway, and problems associated with signing for the second exit. Because cloverleafs are more expansive than diamond interchanges, they are less common in urban areas and are better adapted to suburban and rural areas where space is available. The travel distance on a loop, as compared with that of a direct left turn at grade, increases rapidly with an increase in operating speed. On a loop designed for 20 mph (110 ft radius), the extra travel distance is approximately 650 ft. For a speed of 25 mph (170 ft radius), it is about 1,000 ft. Thus for a 5 mph increase in speed, extra travel distance increases 50 percent; the right of way area needed increases by about 130 percent. Travel time on loops varies almost directly with the operating speed, the increased speed being more than balanced by the increased distance. The advantages of increased speed must be weighed against the disadvantages of increased travel time, distance and right of way. It is noted that large trucks may not be able to operate efficiently on smaller radius curves. Considering all factors, experience shows the practical size of loops resolves into approximate radii of 100 to 170 ft for minor movements on roadways with operating speeds of 50 mph or less and 170 to 250 ft for more important movements on roadways with higher operating speeds. A continuous additional lane is needed for deceleration, acceleration, and weaving between the on- and off-loop ramps. Additional structure width or length is usually needed for this lane. The lateral placement of bridge abutments or columns, or mainline bridge widths, may have to be reviewed due to the effects of off tracking at the exit end of the ramp curve. The cloverleaf involves weaving maneuvers for traffic. This is not a problem when the left-turning movements are relatively light, but when the sum of traffic on two adjoining loops approaches about 1,000 vph, interference mounts rapidly, resulting in a reduction of through traffic speed. The weaving lengths presented in Figure 10-68 of the AASHTO Green Book are to be provided on low-volume cloverleaf interchanges. When the weaving volume in a particular weaving section exceeds 1,000 vph, the quality of service on the main facility deteriorates rapidly, thus generating a need to transfer the weaving section from the through lanes to a collector-distributor roadway. A loop rarely operates with more than a single line of vehicles, regardless of the roadway width, and thus has a design capacity limit of 800 to 1,200 vph (the higher figure is applicable only where trucks are not present and where the operating speed of the ramp is 30 mph). Loop ramp capacity is, therefore, a major control in cloverleaf design. Access for all traffic movements at interchanges on the state highway system will be provided. In some cases, traffic volumes may not warrant the provision of all ramps at an interchange at the time of initial construction. However, when this occurs right of way will be purchased prior to initial construction that will provide for the “future ramps”. The plans for initial construction of the interchange will show the location of the “future ramps”, that will provide for these traffic movements. Traffic capacities for ramp design are subject to variation and are limited by the geometric features of the ramp itself, the ramp termini, the weaving sections and the volume of through traffic. An appropriate model, such as the Highway Capacity Manual, is used to determine these capacities. Addition information is contained in A Policy on Geometric Design of Highways and Streets (AASHTO Green Book). Interchange ramps are numbered for ease of identification. Ramp details can be found on Standard Plan 203.40. The geometric layout of a cloverleaf interchange is prepared by the district and includes a plan sheet and a profile grade sheet. This information is submitted to the Design Division for review and comment. Drawings with detail interchange geometrics are developed to the same scale used on the plans and on standard size, 22 in. x 34 in. sheets. The drawing includes complete alignment details for ramp base lines and shows the limits of pavement. A supplemental standard size full profile sheet or cross section sheet is used for plotting profiles and developing ramp grades. The profile is plotted to the horizontal scale used on the plans, and to a vertical scale of 1 in. = 10 ft. (1:100). If a standard size sheet is too small, additional standard size sheets are used, with match lines, or the layout may be prepared on a sheet of multiples of the standard size. The plan is developed to the best possible accuracy since this sheet becomes the base for later drawings (i.e. for grade separation reports). Grades are considered tentative at this stage and are developed in a similar manner to the preliminary plans. The plan sheet(s) includes complete traffic data for the interchange, including all turning movements. The traffic data is shown with the design hourly volume (DHV) over average annual daily traffic (AADT) and also the percent of trucks. At this preliminary plan stage, two prints of the interchange geometric sheets are submitted to the Design Division for review and comment. Three prints are submitted for all interstate projects so approval from FHWA can also be obtained. The ramp curvature at the ramp nose or gore area will have a minimum radius of 6 degrees or less. The delta for this curve will be as small as the ramp grade and location of the ramp terminal at the crossroad will permit. If practicable, the ramp curvature is established so both ends of the curve are at least 100 ft. from the ramp nose measured along the ramp base line. Desirably, the anticipated posted speed on a ramp in a cloverleaf interchange will approximate the mainline free-flow operating speed. This speed is not always practical; therefore, the desirable speed on the ramp is 0.7 of the mainline operating speed, but not less than the values shown below. These values apply to the controlling ramp curve, usually on the ramp proper. For anticipated operating speeds of more than 50 mph, the loop operating speed will not be less than 25 mph, with a minimum loop radius of 150 ft. Anticipated loop ramp operating speeds above 25 mph in urban areas and 30 mph in rural areas are seldom practical. For a 5 mph increase in anticipated operating speed on loop ramps, the travel distance increases over 50 percent and the required right of way increases about 130 percent. If practicable, a speed change transition curve preferably 430 ft. in radius (or at least 230 ft. in radius) is used at the loop terminals, depending upon the corresponding mainline operating speed. This radius curve is compounded with a shorter radius curve for the central portion of the loop. The speed transition curve extends at least 100 ft. beyond the ramp nose and begins or ends at least 50 ft. from the end of the grade separation structure. Minimum radii for turning speeds are shown below. The "basic number of lanes" is a fundamental design control maintained along a mainline roadway in addition to the requirements of lane balance and capacity. The basic number of lanes is the constant or minimum number of lanes provided throughout a significant length of the mainline roadway. This number is exclusive of the number of auxiliary lanes. Indiscriminate adding or dropping of basic lanes is discouraged. At exit ramps, the number of approach lanes on the main-line roadway must be equal to or greater than the number of lanes on the mainline roadway beyond the exit plus the number of lanes on the exit ramp, less one. Major fork and branch connection designs with appropriate signing (see EPG 903 Highway Signing) to designate the optional exit lane destinations may be considered where appropriate as discussed in the AASHTO Green Book. Separate lanes with separate lane use signing are preferred where major forks occur. Minimum speed change lengths are given in Tables 10-3 and 10-5 of the AASHTO Green Book. Lengths shown in these tables are for grades of 2% or less on the speed change lane. Table 10-4 of the AASHTO Green Book provides adjustment to these lengths for grades over 2%. Speed change lanes are provided at all ramp entrances and exits where the number of through traffic lanes each side of the ramp terminal are equal. The combined length of full width acceleration lane and taper will not be less than 600 ft. A shoulder, at least 6 ft. wide, is provided for auxiliary lanes along the through traffic lanes (except a 4-foot shoulder will be provided along a median acceleration lane). Auxiliary lane width is the same as the width provided for the through traffic lanes. In rural areas, the ramp nose will be visible to approaching traffic for a distance equal to at least 1.25 times the stopping sight distance on the freeway. Where interchanges are closely spaced the auxiliary lane for acceleration will be extended to the exit of the next interchange. An entrance lane followed by a lane exiting forms a traffic weaving section that requires added pavement width and length for weaving capacity. The capacity of the auxiliary lane connecting the on-ramp with the off-ramp will be determined using the Highway Capacity Manual or an appropriate traffic-modeling program (i.e. VISSIM). The weaving section will have a length and number of lanes based on the appropriate level of service outlined in the Facility Selection article. Where a two-lane entrance ramp or a two-lane exit ramp is needed for capacity or lane balance, the effective length of auxiliary lane will be determined as illustrated in Figure 10-74 and 10-73 of the AASHTO Green Book. Minimum controls for superelevation of short radius curves on ramps are shown in Table 2. A maximum superelevation rate of 6% is used when a short radius curve is on a bridge structure. This is the maximum superelevation suitable for satisfactory traffic safety under snow and ice conditions. The maximum rate of cross slope change is 5% per 100 ft. to transition the superelevation cross slope back to normal cross slope. Ramp entrances and exits are designed to reach full superelevation at the ramp nose, if full superelevation can be obtained at this point. Superelevation transition for typical ramp entrances and exits are shown on standard plans. At ramp terminals with the thruway, the maximum algebraic difference in pavement cross slope is 5%. The general grade layout of interchanges, such as crossroad over or under and ramp grades is selected and designed with grading economy in mind. The desirable maximum ramp gradient is 5 percent. In special cases, ramp grades as steep as 7 percent may be used. The use of grades steeper than 5 percent is usually restricted to short grades in urban or suburban areas. Vertical curves for ramps, both crest and sag, are designed to meet the requirements given in the Vertical Alignment article based on the desirable ramp operating speed, except passing sight distance is not considered. The ramp grades are also designed in accordance with these same requirements, regardless of whether the ramp grade is up or down in relation to the roadway. Mainline grades are set, if at all possible, prior to developing the geometrics and ramp grades. The best procedure is to develop grades through and adjacent to the interchange so mainline grades outside the interchange area can be adjusted to finally balance grading quantities, and the crossroad through the interchange can be adjusted as necessary to provide near minimum vertical clearance for the grade separation based upon the final structure layout. This procedure will cause a minimum of revision to the geometrics as the grades are finally adjusted. Grading quantities in interchange areas Class A, Class C or Unclassified Excavation will include site grading necessary to properly handle drainage, to improve appearance, and to eliminate poor sight distance of other intersections. Where possible site grading is done for all interchange areas. Preliminary plans are reviewed carefully to determine if minimal site grading will address these items and yet provide economy in the design. Where site grading of an interchange area is made, it is desirable to provide flat slopes and smooth contour lines. Slopes on the outside of ramps will not be steeper than 1:3 and carried back to its intersection with the mainline roadway. This page was last modified on 28 September 2018, at 14:16.